Range Resources has finalised the drilling schedule with LandOcean for the next 22 development and exploration wells. This schedule complements the work programme released on 7 August 2015. 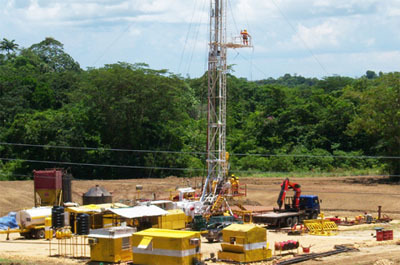 It is expected that the proposed 22 wells will be drilled by the end of Q1 2016, however certain drilling logistics are beyond the Company's control and, therefore, the drilling schedule remains subject to a number of variables, including availability of suitable rigs, arrival and commissioning of new rigs into RRDSL's rig fleet, various regulatory approvals, and the construction of drilling pads. RRDSL will also be required to recruit additional drilling staff to operate the new rigs. The Company has been granted permission to construct 15 drilling pads. Construction of the drilling pads for the wells GY 161S, MD 42N, Canari North, GY 180SE and QUN 158 redrill has been completed. Contracts for land work and construction of the remaining 7 locations are currently being negotiated.